Home News First Trax Some Snow. Some Wintry Mix. Some Snowmaking and Some Video! Some Snow. Some Wintry Mix. Some Snowmaking and Some Video! Kenny was 4 for 5 yesterday in getting cams back running. We’ll try to get the Smoketree camera going again next week. There are also some ski areas that are not quite ready for primetime and their cameras are not all operational. However, we expect those to come online shortly. Light Snow is being reported at Bryce Resort in Virginia with 32°. We’ve toggled on their SNOWMAKING tab as they did make snow a bit on Wednesday. Thanks to Bill Nabers for reporting on that news. It is MUCH colder into West Virginia this morning as was the case on Wednesday. Kenny Griffin and I were out around the High Country working on some webcams (mostly Kenny) on Wednesday and thankfully the temps here were in the low 40s while we witnessed 24° at Snowshoe, Canaan and Timberline. That is the case again this morning. We are seeing temps about 10° colder around Davis and Snowshoe, WV. That reminds me – When I post videos these days…a LOT of you are viewing them before I even get them posted on the site. You can do that by Subscribing to our SkiSoutheast YouTube Channel. Just visit and click to SUBSCRIBE. 27° Snowshoe Mountain – they ARE making snow and they also have received a TRACE of snow according to the NWS. That also shows on their Ballhooter webcam. Something special about this place! 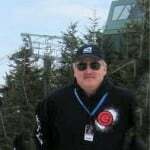 I have to get with my brother Shawn Cassell because Snowshoe is reporting 0″ of snow on the season and they are actually already at 6″. Click to Enlarge shot of the base of Snowshoe this morning. As of 9:30am you could see a bit of wintry mix falling via the Basin Camera. 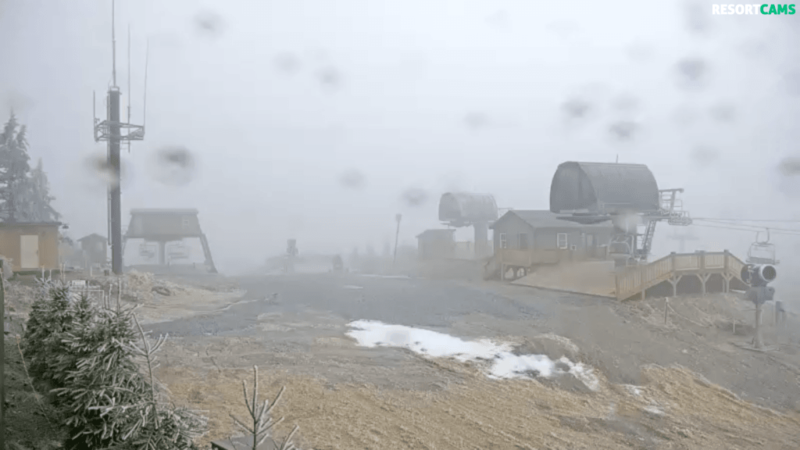 34° Appalachian Ski Mountain – no snowmaking. The NWS is reporting light snow, but it is more like light-to-moderate rain. App advises to check back for future Opening Day updates as they will be posted as this information becomes available. Click to enlarge ICY shot of Appalachian. 39° Beech Mountain Resort – They report – Snowmaking will resume as temperatures allow. Opening day will be determined once we have consistent cold temperatures and a quality product. Continue to check back for daily updates on our snowmaking progress. Click to Enlarge the top of Beech. 32° Bryce Resort – made some snow on Wednesday but the guns are off right now. 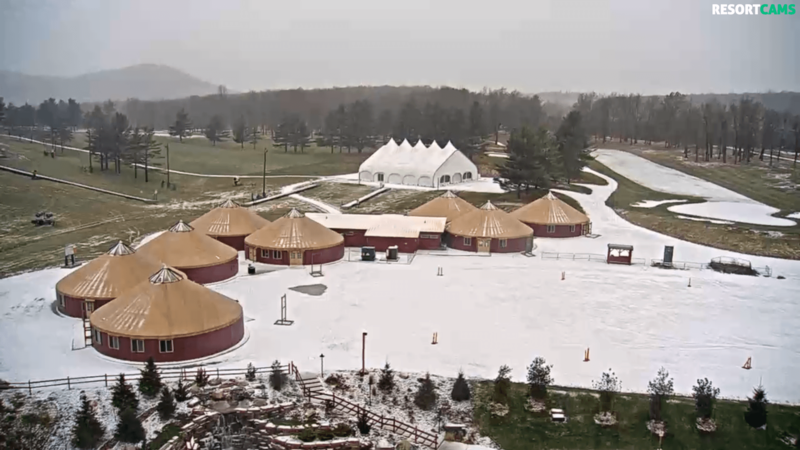 23° Canaan Valley Resort – made snow yesterday but things look iced over this morning via the webcams. Not sure about snowmaking right now. The NWS is reporting light rain right now at 25°…which is unusual. 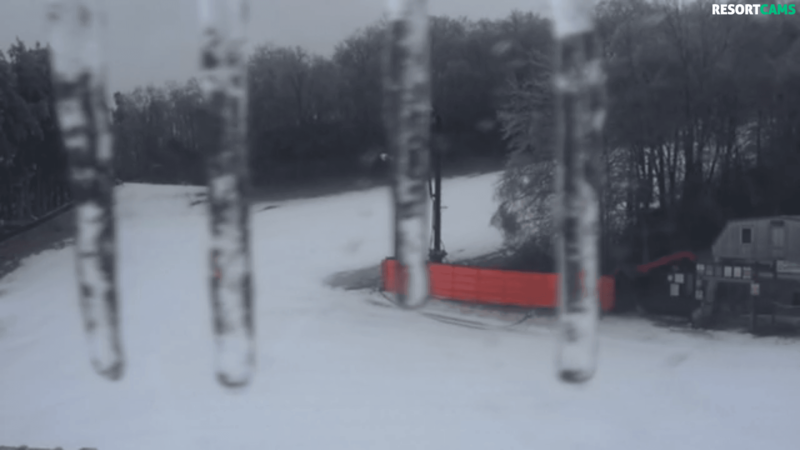 34° Cataloochee Ski Area – heavy drizzle and no snowmaking. Yep, she calls me Mikie which is cool, cause that’s what my family calls me. Tammy’s family so that’s just fine with me. 32° Massanutten Resort – Trace of snow but no snowmaking happening this morning. 43° Sapphire Valley – No snowmaking. They DO have their webcam back positioned at the ski area. 33° Sugar Mountain – Again this morning…when nobody else in the state is yet making snow, they have their guns running – making something. They did decide to temporarily shut down the slopes this morning and are now closed. They will open asap. 23° Timberline Resort – Don’t have a lot we can tell you yet about Timberline. Reports are that they HAVE put their chairs back in the lifts. We know they are attempting to get open. However, word is that they don’t have power, phones, etc. They typically don’t open until December so we’ll keep our fingers crossed and ear to the ground. 27° Wintergreen Resort – no snowmaking. It has been more quiet than usual for Wintergreen. 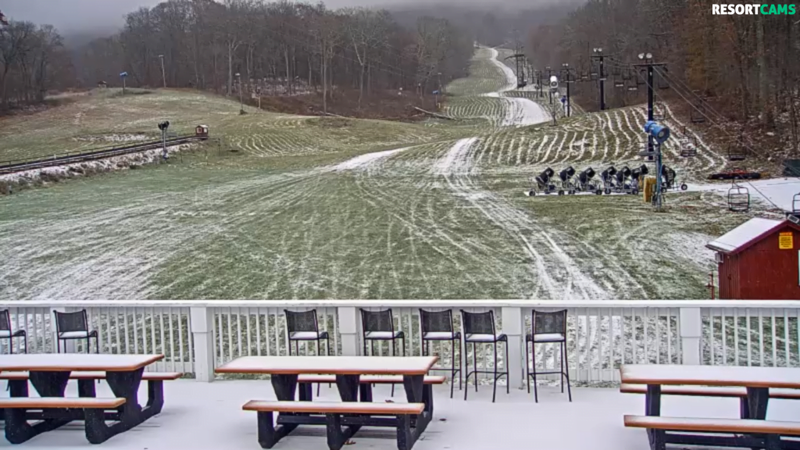 29° Winterplace Resort – we know they made snow yesterday. Also glad to see both webcams back LIVE. 25° Wisp Resort – Trace of snow but no snowmaking. 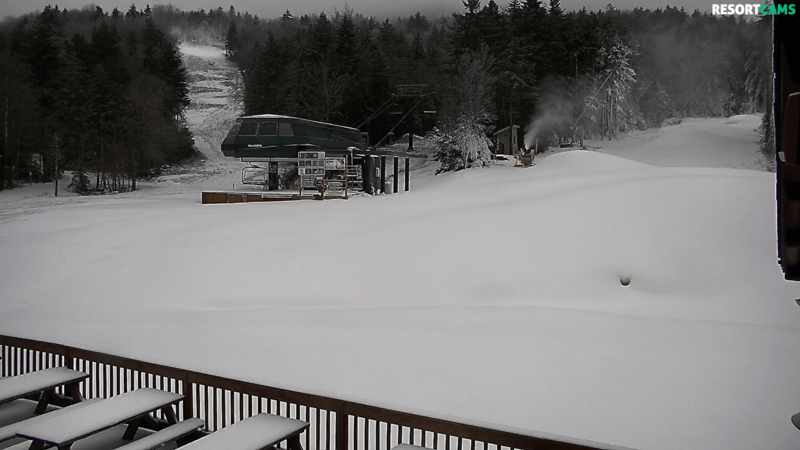 I had to chuckle at the Wisp Marketing peeps attempt to post a snowmaking video. If you look at their facebook page it was posted sideways! We fixed it for them and have it here. It was shot vertically, so this is a little frame space showing. However, we LOVE her attitude! Next articleC and R Ski & Outdoors Hosts HUGE SALE Nov 16-25th!